Live Action Planetarium Show. An exciting new-type of family show that perfectly combines live theatre with an immersive 360˚ full dome planetarium experience. Join the hosts of Wow Tours on an out-of-this-world adventure as they attempt to put everything in its place – in our Solar System, the Universe and beyond! WOW Tours are expecting to attend a lecture from The Professor only to find themselves unexpectedly confronted with the disappearance of the stars - not to mention the disappearance of The Professor! With Jupiter as the ultimate ‘behind you’ moment, a zoom through Saturn’s rings and a voyage down to the surface of Mars, this is a tour you’ll never forget. This 30-minute show is designed for children and their families. Be inspired to look up at the night sky and it could be the start of a lifelong adventure. Tickets are in addition to Thinktank admission price. Tickets should be purchased at the ticket desk on arrival. YOU ARE HERE! 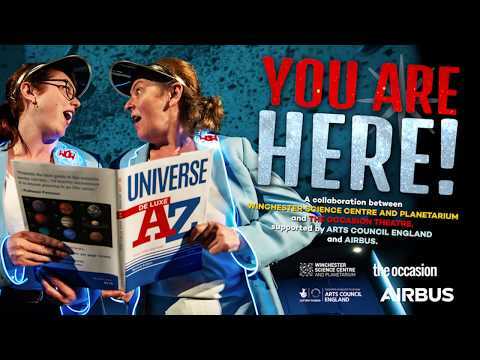 is a collaboration between Winchester Science Centre and Planetarium and The Occasion Theatre, supported by Arts Council England and Airbus.